The death of 1st Hampshire Representative Peter Kocot has become the latest upheaval in the Upper Pioneer Valley’s legislative delegation. Kocot, 61, died last week of an undisclosed illness. His death has hit state and local pols to a degree that matches or exceeds the concurrent political consequences. Kocot, like his retiring colleagues in abutting districts, had been a presence in the legislature for well over ten years. His co-chairmanship of the Healthcare Finance Committee put him at the epicenter of one of Beacon Hill’s thorniest issues. The Northampton rep’s passing has hit colleagues particularly hard. “We have a tight knit close delegation here in Western Massachusetts,” Senator James Welch told WAMC’s Northeast Public Radio. “Peter is definitely going to be missed by all of us.” Welch is the Senate co-chair of the Healthcare Finance Committee. The 1st Hampshire covers Hatfield, Montgomery, Northampton, Southampton and Westhampton. Kocot’s death came amid tremendous political churn in Franklin and Hampshire counties. Democratic Reps Stephen Kulik of Worthington and John Scibak of South Hadley are retiring. The reps for the Amherst-centered 3rd Hampshire and the more sprawling 2nd Franklin have left the Democratic and Republican parties respectively and become independents. This all after Senator Stanley Rosenberg stepped down as Senate President amid an investigation into his husband. Both Kulik and Scibak, elected in 1993 and 2002, had secured plum posts in the legislature. First elected in 2002, Kocot’s passing compounds a personal loss with a political one for the district. “Representative Kocot was a man of immense conviction, compassion, and intellect who cared deeply about the people and communities he served and the everyday issues affecting their lives,” Northampton Mayor David Narkewicz said in a statement. In addition to praising Kocot’s work for social and economic justice, the mayor also highlighted the late rep’s dedication to his wife and sons. 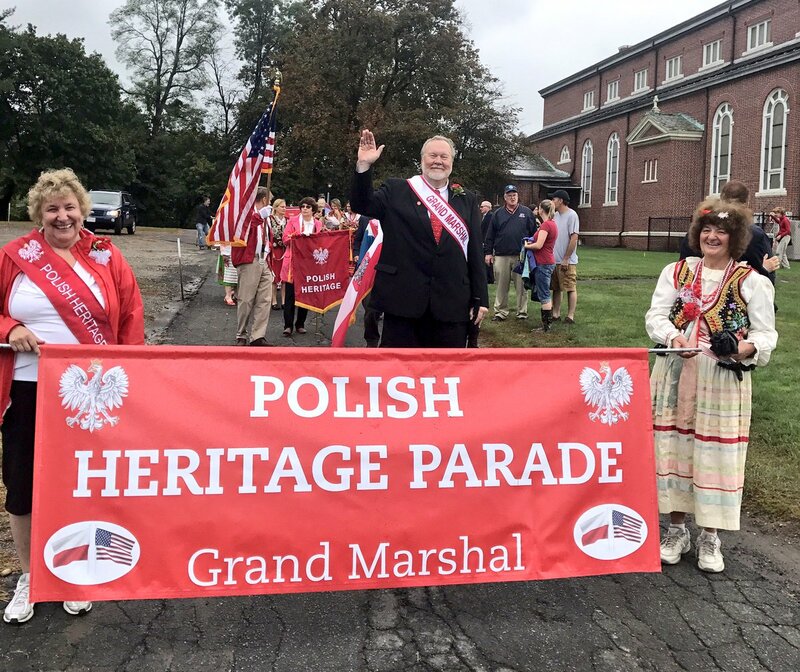 Narkewicz changed his Facebook cover photo to one showing Kocot marching at a Polish heritage festival. The mournful praise was no less effusive from colleagues past and present. “Peter was the consummate gentleman: gracious with his time, energy and intellect,” House Speaker Robert DeLeo said in a statement. Noting his work on a “challenging” committee, DeLeo said Kocot earned respect from all who worked with him. “Peter was the model of a public servant and we are all better for having known him,” the speaker said. Calling hours are 2-7pm Monday at Czelusniak Funeral Home in Northampton. Funeral services are 10:30am the next day at the city’s St. Elizabeth Ann Seton church. It is unclear whether a special election will be held or if the seat will remain vacant until November. Regular election papers are already circulating. The Secretary of the Commonwealth and the legislative body with a vacancy generally schedule a three to five month window for special elections. For example, after Boston Senator Linda Dorcena Forry announced her resignation last month, candidates had until last Tuesday to submit nomination papers. The primary for her arch-Democratic seat is April 1 followed by a probably perfunctory general election on May 1. Kocot’s seat is also heavily Democratic, but no one can be seated until after a general. That likely won’t be until June or even early July. The current session ends on July 31. Any new 1st Hampshire rep would likely miss the House’s biggest annual item, the budget, usually written by mid-April. By comparison, Westfield Rep John Velis won his seat in an April 1, 2014 special to fill now-senator Don Humason’s seat. Velis did not take office for another two weeks. Yet colleagues could budget items on the rep-elect’s behalf. Looking back a few cycles, legislative special general elections have occurred no later in a term than May of an election year. A 2010 special to fill a seat in Lawrence happened in June, however. Yet, the House declined to hold a special for Rep. Cheryl Coakley-Rivera’s seat in 2014. She resigned in late March for an assistant court magistrate gig. Now-rep Carlos Gonzalez took the seat in the regularly scheduled election. Unlike Kulik or Scibak’s district, one community dominates Kocot’s district: Northampton. Of the 40,000 people in the district, 28,000 live in Noho. Smaller towns in the 1st Hampshire will likely be far less decisive than those in neighboring districts. That might make the race more like the 3rd Hampshire in 2016. Pelham and a Granby precinct share the district, but Amherst is the dominant community. After Ellen Story retired, the entire field of candidates to replace her, including victor Solomon Goldstein-Rose, lived in Amherst. Amherst diffuses power via Town Meeting and a select board. With no clear power centers, the 2016 race became a free-for-all. The 1st Hampshire race may not be. Northampton, home to Gloria Steinem alma mater Smith College, shares Amherst’s liberal ideology. Yet being a city, its power is concetrated in a mayor and council. While the old political machines may have broken down, power plays, urban coalitions and intrigue still echo loudly in city affairs. The rep race may reflect this. As the grieving subsides, ambitious pols in Northampton may look around and begin wondering more publicly whether they benefit from a special or by waiting for the regular election. If a special happens, some may skip it and run in September’s regular primary. It may be macabre to consider, but a particularly spirited election in the 1st Hampshire may be a final part of Rep Kocot’s legacy.